Some of the artistic niche fragrance leaders who will soon convene at Esxence in Milan. 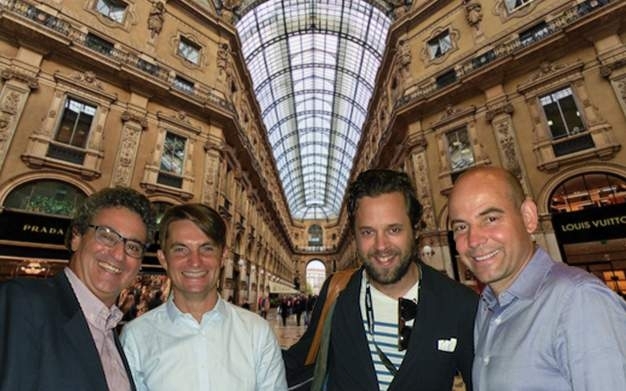 Left to right: Silvio Lévi, founder of Esxence, James Heeley, owner of Heeley Parfums, Nicolas Cloutier, CEO of NOSE perfume boutique in Paris, and François Duquesne, CEO of Beauty Entreprise. Esxence, The Scent of Excellence held in Milan each year, is arguably the single most important annual event in niche perfumery. This year’s 6th Edition of Esxence will take place Thursday, March 26, through Sunday, March 29, 2015. Six weeks out, Esxence is already the subject of much talking and planning in the Paris artistic niche fragrance world I inhabit. A conversation with François Duquesne at a dinner party the other night sheds light on some of the reasons why…. For ‘la petite histoire’, François is a ‘fragrance mentor’, a person who guides a brand through the entire fragrance production process, from conception to creation to marketing and sales. As CEO of Beauty Entreprise, François is perhaps best known for his master coup in the conception of Aedes de Venustas, a pioneer and icon in American niche fragrance. François is also the licensing partner of the brand, Aedes de Venustas. François describes Esxence as ‘The Sundance’ for artistic niche fragrances. “Esxence is basically Sundance for the perfume industry,” François says. “Like Sundance, which is where independent film people meet, far from The Oscars which are oriented to the needs of the big guys, Esxence is where the independent fragrance community meets. Esxence is what’s happening and Esxence is where we know we will find what we need. One of the reasons Esxence is so successful is thanks to the vision, experience, and personality of its founder, Silvio Lévi. As an industry player who wears many hats (in addition to producing Esxence, Silvio is a distributor, a brand owner, and retailer shop owner), Silvio knows the independent fragrance business from every angle, and has tailored Esxence to fit the exact and individual needs of each participant. Silvio is also an open and generous person, and thanks to this, Esxence has a happy and upbeat feel to it, and is a very agreeable place to meet up. Esxence is a rich and interactive market place where the most important actors in the worldwide independent fragrance industry convene. This is my chance to show them what’s new in what I’m doing, and where I’m going. Again, because of Silvio’s first-hand knowledge of how individuals in the industry work, Esxence is set up to meet our needs. Esxence has the structure of a classic exposition where each brand has a booth, and each brand can express and show everything about itself. Esxence is not a ‘one size fits all’ exhibit. It’s something each brand can personalize. As a brand, this is very important for me. BE at the heart of the Italian market. The Italian market for independent perfume brands is vital because it’s made up of lots of independent retailers. For me, personally, it’s my largest market in Europe, and my second largest market in the world. It’s very important for me to be at Esxence because this is where I can connect with my local retailers, and since Esxence is open to the public on Sunday, I can also meet my local consumers and get useful insights. Meet up with friends and peers, and all the people who are active in the industry in a very convenient and happy way. Esxence is what we would call in French a yearly rendez-vous where we get to network with our friends and competitors in the industry, and see how everybody is doing. This is really important because we are in a tough world as entrepreneurs, and sometimes it’s easy to feel like we are alone. It’s good to reconnect with the other people and see that we are not the only ones struggling (he laughs), and to share our successes as well as our failures with people who do the same. This dynamic and convivial mix of people is great for everybody because we get to meet those we might otherwise only know by reputation or email. And we meet each other everywhere, not just at the stands – we meet at the exhibit’s café and restaurant, at the entrance, at the panel discussions and workshops, at the parties…. Mark your calendars in RED. When: Thursday, March 26, through Sunday, March 29, 2015. Where: The Mall, the heart of the new Skyline of Milan, in the Porta Nuova Events District. For insights into last year’s of Esxence check out this and this. Nice to read the opinion of people who had positive experience at Esxence. François is a friend of us as the lovely Sarah and the active and curious Karen. So don’t trust their kind words about me. Esxence is a community and everything happen is the result of a common work and huge passion for the wonderful perfume world. Make a passion your work is a gift and once you get it you have the duty to deserve it. It will award you all over your life! I look forward to meet all our friends soon and once again I would thank Sarah for her passion and fruitful chats! There’s a lot of spirit and passion at Esxence, Silvio. Thanks for all you do to make it happen every year! Looking forward to seeing you at Esxence, Francesca. Hi Sarah, I’m attending for the first time as I’ve only recently discovered a love for perfume. Great article by the way. And I’m really excited about going and will hopefully meet a lot of interesting people and try some new creations. Glad to hear you’ll be at Esxence in Milan. I’ve been following you on Instagram, and and only recently discovered your blogpost,”Megan In Sainte Maxime” (https://meganinstmaxime.wordpress.com). Especially liked your “February Perfume News Round Up : So Many New Perfumes + Tauerville”. Looking looking forward to meeting you at Esxence..It’s going to ROCK!